In professional sports, championship rings are the holy grail of athletic glory. Some will commit a lifetime in pursuit of one and never find success. Others will fill their entire hand with bling. The very best move to their second hand. That same talisman of championship glory can be found in the form of fantasy football championship rings, trophies, and even belts. Whether you have a serious keeper league or something much more informal, the allure of the championship memento is undeniable. Shop Fantasy Football Championship Items on Amazon. 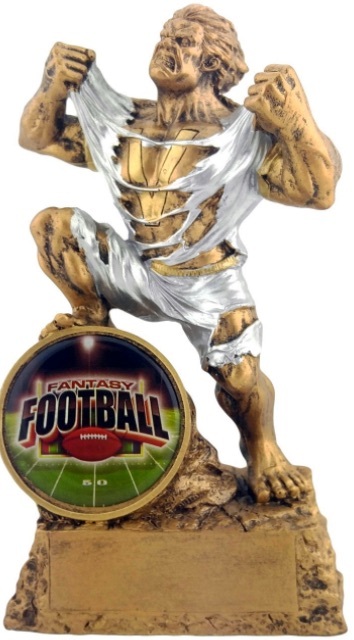 Luckily for fans and collectors, fantasy football hardware comes in many price ranges. For those that are really dedicated, you can have custom items created to meet your exact specification. However, these can get very expensive, especially if you opt for real jewels. For most, a cheap fantasy ring or trophy will suffice. Don't expect real diamonds or solid gold on these, though. If you are interested in something that can be worn and used for display, belts are another option. As many fantasy football participants are aware, championship items are not so much about the monetary value as it is the prestige and pride of what they represent. Plus, it is a fun way to rub it in your friend's faces when you take them all down. Although this guide is catered to fantasy football, most of the suggestions work just as well with fantasy baseball, basketball, hockey, soccer or any other sport you follow. 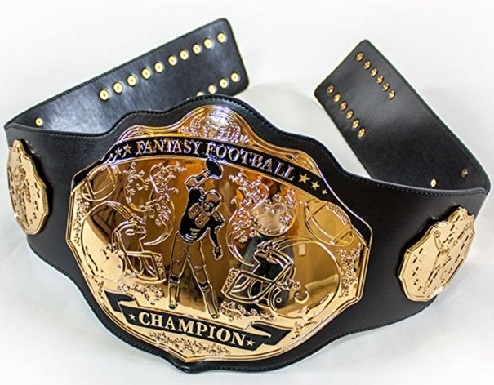 While championship belts have long been a mainstay in wrestling, and have even been featured as cards in products for WWE and UFC, the fantasy football championship belt is one of the newest options to crown the league winner. Like a traditional trophy, the belt can be reused each season and offers an additional interactive element. There are multiple options and price points on eBay, but Undisputed Belts appears to be one of the most popular belt brands available based on good reviews and a more moderate price. Adding to the appeal, they sell direct on Amazon with free shipping for several different color schemes. The majority of fantasy football leagues out there are geared around fun. Even if you spend a couple of hours during the week watching the injury charts and comparing matchups, it usually boils down to pride and maybe a small prize to go along with it. These sorts of leagues are perfect for a simple fantasy football ring. Many fantasy football title rings can be found on eBay or Amazon for under $30, a small amount for even the most informal gathering of pigskin aficionados. Whether the league manager foots the bill, it's added to the entry fee, or is split between participants, the amount is minimal when you think of what it symbolizes. 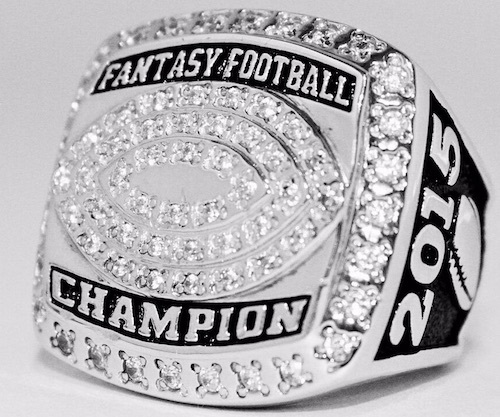 At a quick glance, cheap fantasy football rings might resemble a real championship sports ring or a graduation ring. You probably won't want to wear one to a fancy party unless it involves chips, dip, some couches and a big-screen TV. Expect low-end materials or plating on these cheaper types of rings. Instead of diamonds, you're going to get cubic zirconia. The main downside to the ring as a championship item is that they are individually sized, so the re-use potential is greatly limited unless everyone has the same ring-finger size. Plus, they can be very easy to lose. If you're involved in something much more serious, a custom fantasy football ring might be in order. These have a lot more options but just be prepared to pay for it. While some can be affordable, many custom rings get real expensive once you factor in the added cost of gold, silver or diamonds. Several websites exist for options like this, including Jostens. You could even visit a local jeweler and see what is available as far as designs, materials and jewels. 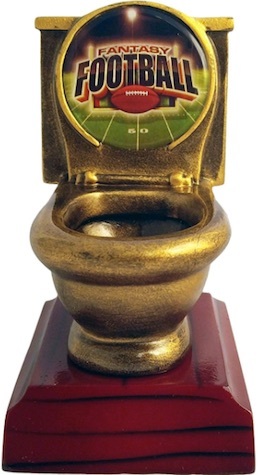 Another way to honor a fantasy football championship is the traditional trophy. Like the other choices, you can find a fantasy football trophy to meet your league's size and personality. You could go for a faux Lombardi Trophy, Heisman Trophy, silver cup or something a lot wilder. eBay has a lot of options, including several sellers that offer custom engraving. Amazon has multiple choices, as well. The benefit of a fantasy football trophy is that it can be passed around to a new winner each year, but some leagues may opt for keeper trophies. These are great to display in man caves or living rooms where entire families can bask in the fantasy glory. Not reserved for only the winners, there are even options geared to the less-successful players in your group. From small trophies to license plates, shirts or glassware, there are plenty of ways to burn your friends. Be aware that some are very crude, so it is best to know the group you are dealing with so as not to offend. They are also quite cheap on eBay, usually under $15 for something that can be used each year. Again, Amazon has many "loser" choices, including quite a few with a toilet theme.